I woke up with really sore calf muscles this morning. So before I headed out on my run, I did a lot of stretching. It took me a while to figure out that they were sore from all of the calf raises that I did yesterday. I did a new route hoping it would end up being a 5 miler, it ended up being a 4.75-mile run...so close. But once I got my muscles warmed up and moving it felt really good. 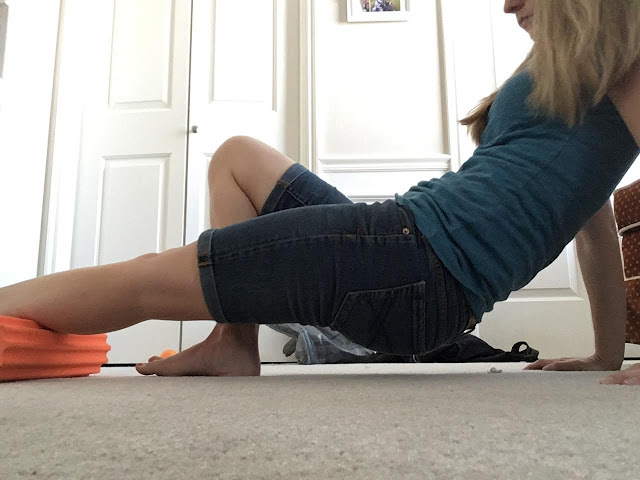 After getting ready for the day, my legs started to feel tight again and I decided it was time for a good foam roll. It doesn't work as nicely when you have jeans on. But it felt good. While I was eating breakfast (yogurt with granola on it) the kids kind of just wandered around the house making messes. 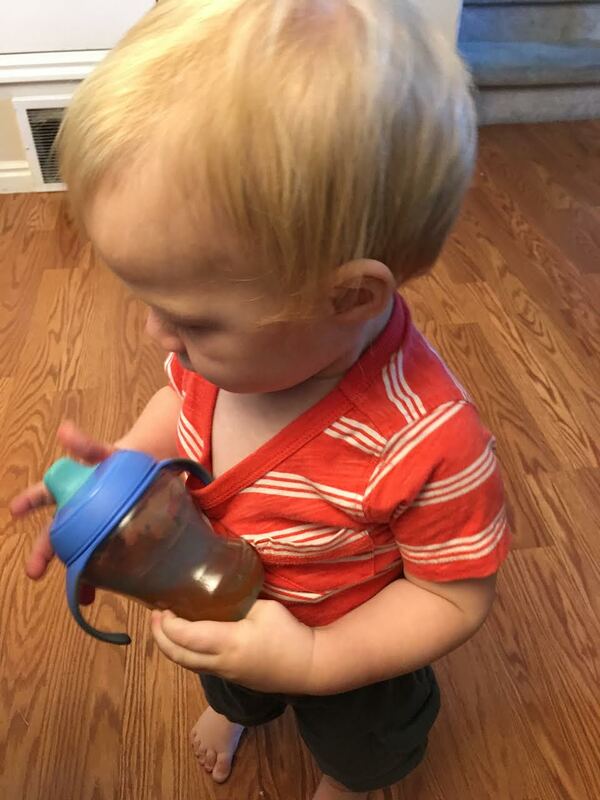 I looked over and noticed V was walking around carrying his sippy cup like this. Hanging on his shirt like you sometimes do with sunglasses. M slept in really late today (It's a MIRACLE!) so J and I worked on some of my old puzzles from when I was a kid. 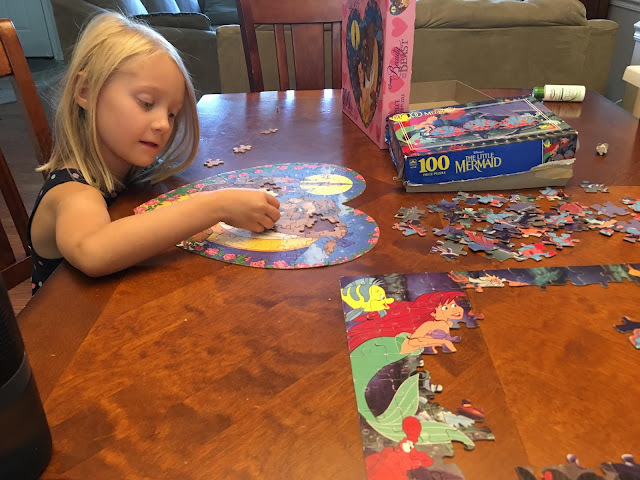 I'm really impressed with J because she did most of the Beauty and the Beast puzzle on her own. We stopped by my parent's house for a minute and while I was outside V wandered inside. It was really quiet, so it surprised me to see him looking at a book instead of getting into mischief. This is his favorite book. It's called DEAR ZOO. 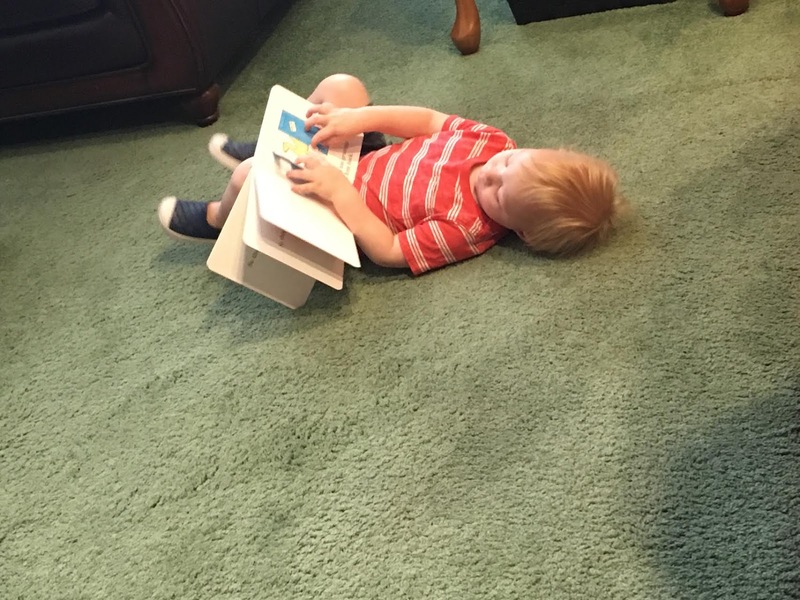 He finds this book every time and wants to read it 10 times in a row. J was the same way about Brown Bear. M liked Go Dogs Go. While I was running today, I realized how much of running is muscle memory for me. I think what made me think about it first was that I meant to go on a totally different run, but about a quarter of the way through it I noticed I was running one of my normal routes and not the new one I had planned. So I took some different turns here and there to add mileage on to it, and now I have a whole new route, and it was a fun one. There are definitely times when it is much more challenging to get through a run for me. But for a lot of runs, like today's run, it was a lot of just zoning out and letting my body do the work without my brain having to work too hard. I think that there are a lot of things like this. Kind of like playing the piano, the more you practice, the more your fingers just get used to moving in certain patterns. After a while, it just doesn't take a lot of thought and concentration to do it. I think running can be the same way. The more we do it, the more we work through the hard runs that do require a lot of concentration and self-encouragement, the more runs we will have in the future that we can just put our bodies on auto pilot and go. Muscle memory helps a lot with endurance too. Once your body is used to running, the mental game stops becoming quite so hard when you can let your mind wander and your legs react to the muscle memory. The next time I realized that muscle memory had taken over today was when I was almost done with my run and I noticed what was happening with my body and I wondered how my legs hadn't slowed down even stopped moving even though I'm not concentrating on moving them or hitting a certain pace. Muscle memory also affects our running form. That can start out as a bad thing. I never had the best running form, it's certainly still not perfect, but better than it was. 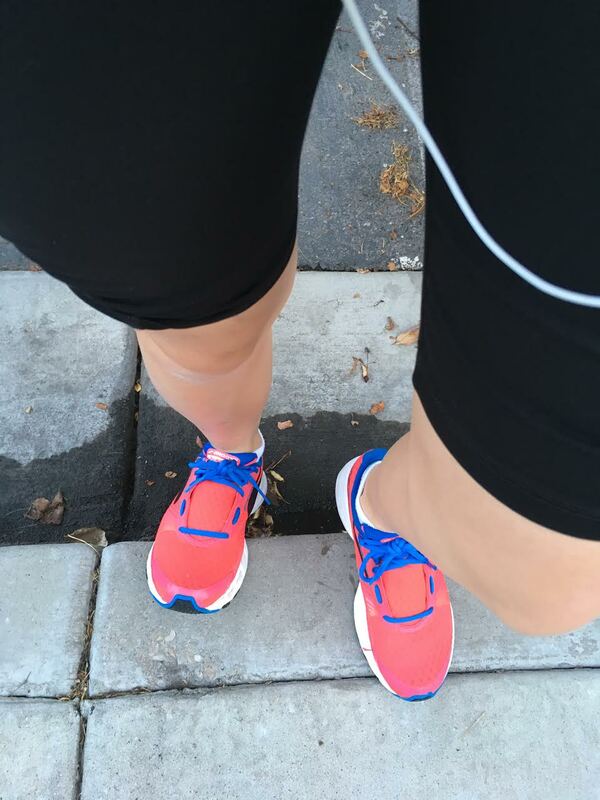 My biggest running form problem was that I heel stuck all the time. It was just the way my body moved and I wasn't even aware of it until it was pointed out to me. It took a lot of practice to correct that. I don't heel strike anymore, and thanks to muscle memory, I don't even have to think about where on my foot I'm landing. Our bodies are amazing things! Do you still have any of your old toys from when you were a kid? What is one thing you have really good muscle memory for?